Our development tools include stand-alone OBD-II and J1939 simulators with support for SAE J1850 VPW and PWM, ISO9141-2, ISO14230-4, ISO15765-4 (automotive CAN), and SAE J1939, OBD chips, and development boards to get any OBD project from start to finish. OBD Simulators are invaluable development tools for the development and testing of OBD-II diagnostic programs and hardware. The OBD Development Boards are the perfect for OBD-II hardware engineering projects. 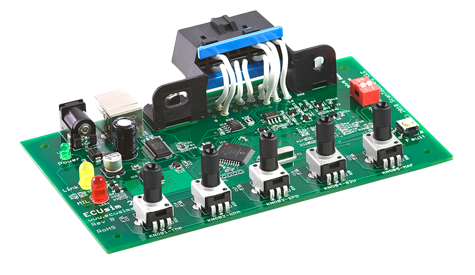 It features three removable modules, each with breakout headers that allow you to easily insert your own circuit design, and verify it operates as intended without having to build out a complete OBD-II interface.